6.2 @ 3:30am on Dimple Dell Mt Road w/Missy. 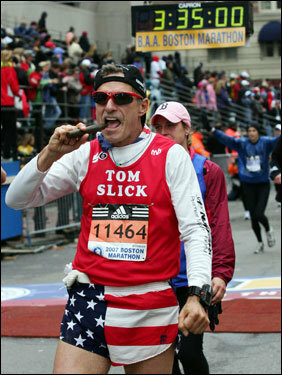 202 days till Boston. Missy is training for Ogden 2015. Hey Lark, welcome to the FRB................lets hear from you! 5 mi @ 3:30am on 17th and 13th East loop....42 degrees, dark, clear and nice. Rest day for me, following all my friends running the St Geo Marathon.........good luck runners! 6 mi @ 3:30 am....cool, dark and 45 degrees. WEIGHT LIFTING DAY, RUNNING REST DAY. 8 mi @ 3:30am....44degrees, dark, cool and oh so quiet! 3 mi @ 10: am, @56 degrees, partly cloudy w/lots of sunshine. 20 days and a couple of hours till Ragnar Las Vegas and only 183 days till Boston 2015. I was on the BAA website and I noticed that there were only 356 runners invited to the 2015 Boston because they had 10 or more consecutive runs at Boston.. I thought there would be more than that! And I was certainly surprised when the BAA invited me to register back in August. rest day - 2 mi @ SHP. I just kinda slept in this morning, maybe I will run this afternoon. 14 days till Ragnar Vegas where I get My Saints and Sinners medal. 9 mi on the double D Mt road at 6:30am....went out and backed up my 8 miler yesterday with 9 this am to mimic the 17 mi that I will run in less that 24 hours at the Vegas Ragnar in November. I feel good! 6 mi @ 3:30am on the Dimple Dell W/Missy. 6 mi @ 3:30am w/Missy on the Dimple Dell.